The Yandex Advertising Network (YAN) is an ad-serving platform that consists of websites, mobile apps, Smart TV apps, and videos. Ads from Yandex.Direct are served in ad blocks on these platforms. Only quality web resources with high traffic can join the Yandex Advertising Network. Each resource that requests to join the Yandex Advertising Network must pass a multi-step moderation to ensure it complies with the Terms of Participation. Yandex does not allow web resources to join the Advertising Network if they publish low-quality content or were created solely to make money through ad placement. You can count on the quality of the Yandex Advertising Network audience. 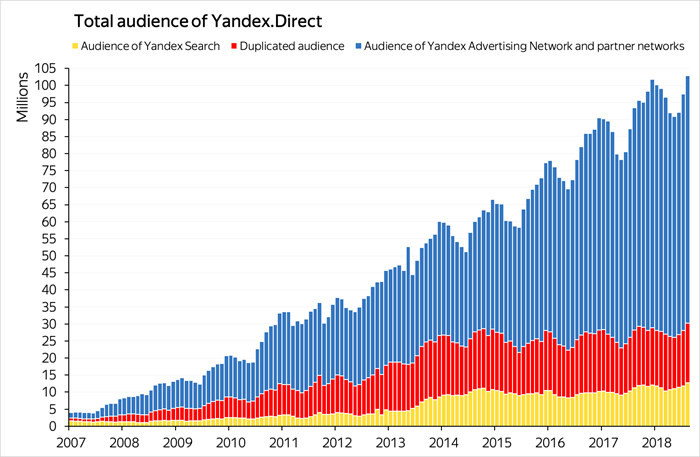 Currently, the YAN audience comprises tens of millions of users and a large percent of them don't overlap with Yandex search users. Therefore, placing an ad on YAN websites will allow you to expand your audience coverage. 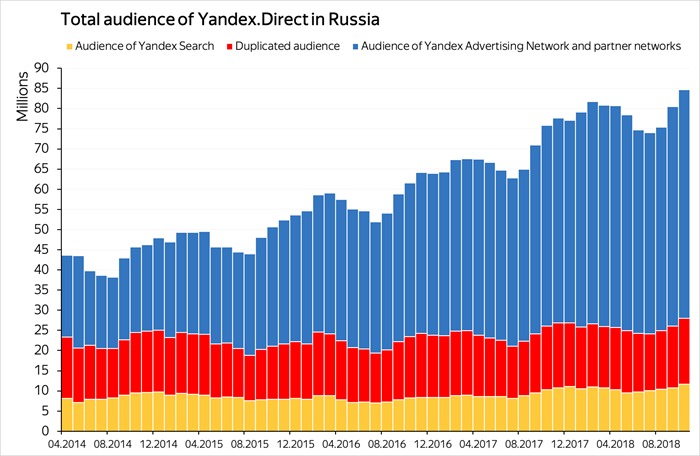 Note that there is not much overlap between Yandex search and YAN traffic. Source: Yandex research, October 2018. Audience of Yandex.Direct: the average number of users per day who saw 50% or more of a banner's area for at least two seconds. The cost per click in the YAN depends on the quality of each partner website audience, the competitive environment and the current number of relevant content sites. Under most Yandex.Direct strategies, the advertiser can control their YAN budget by limiting their CPC. The maximum cost is a percent of the maximum search bid that does not exceed 100%. To fine-tune your settings, you can use a strategy with manual bid management. To manually set the CPC in ad networks, you must either choose impressions "Only in ad networks" or enable separate bid management in the strategy settings. If an ad has a low CTR value, this does not adversely affect its bid value on search. If you want to place Yandex.Direct ads on your website, please read the Yandex Advertising Network Terms of Participation. In addition to on YAN, Yandex.Direct ads may also be served on content sites from ad exchanges such as Smaato. Yandex carefully checks each web resource (site, mobile app, etc.) where Yandex.Direct ads may be served. Sites in ad exchanges are reviewed by a moderator and are subject to quality monitoring just as YAN resources are. Your ads will automatically be served in ad exchanges if your campaign is configured to serve ads in networks.